There is so much fun to be had in the Village of Lake George! Lake George offers a variety of fun activities for the whole family, especially for kids. No matter if you're looking to hike or go-kart, the Village has something for any child. Check out some of the top kids activities in the Lake George Village below, and your kids are sure to be happy-campers! Grab the kids and head out for a fun day of mini-golf! As a kid favorite, the Village offers a variety of mini-golf courses that are sure to put a smile on your little one's face. Check out some of the mini-golf courses in and around the Village for the perfect afternoon outing with the kids! Go-Karts are a kid favorite, especially in the Village! 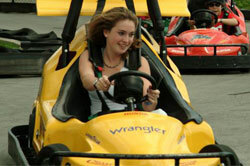 Kids can drive their own go-karts, speeding and racing around the track! There are a variety of places to go-kart in and around the Village, so you'll be sure to find the perfect spot. A local favorite is The Fun Spot - it's a short drive out of the Village, but totally worth the travel! Take a ride of the Lake George trolley for some fun with the kids! The trolley is the perfect event for the whole family in the summer - you're able to see so much of Lake George and the Village. 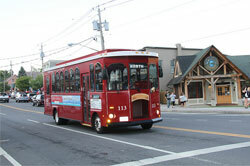 Plus, the kids will love the vintage, red trolley feel - definitely a kid favorite in the Village! What kid doesn't like to play games and win prizes at an arcade? 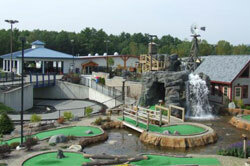 The Lake George Village is home to a variety of fun center for kids to play games and win prizes. Laser tag is an arcade favorite as well. 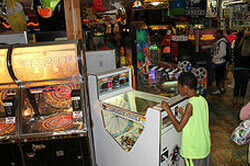 The perfect activity on a warm or chilly day, arcades truly are fun for the whole family! Take the kids to an arcade in the Village, they won't want to leave! Looking for some spooky fun with the kids? 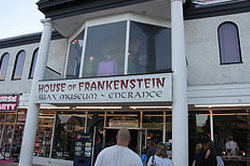 Head to the House of Frankenstein Wax Museum to see monsters and creatures roaming the halls! Your kids will love this fun-filled attraction, sure to create lasting family memories. So grab the kids and prepare for a journey of terror, where everything is dark and chilly! As one of the most scenic and quaint trails, Prospect Mountain is the perfect attraction for the whole family in the Village. This 3-mile hike is quite steep, but not too steep for the kids. 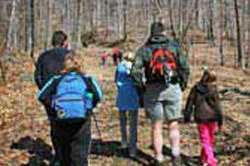 With the choice to either hike or ascend by car, Prospect Mountain offers a beautiful 100-mile view. Check out a video of Prospect Mountain to get a glimpse of the view for yourself! Grab a waterbottle, snack and the kids for a fun day outdoors!